Piketty’s book irked people for a number of reasons, including me initially. One reason, I think has to do with the grandness of his book. First, there’s the title. It implies this is a follow on to the great text by Marx. Second he does things like state fundamental laws of capitalism, as if economics were physics and Piketty is the 21st century Einstein. While Piketty can seem grand at time, he’s also humble in other parts. Throughout the book he often confesses to the limits of his approach based on the data (or lack of data) he has. He still has a lot of data and he has done a lot of analysis, but he is aware of the limits of it. This humility helped me get over the parts that irked me. For non-economists like me, I think the book is most enjoyable when Piketty relates economic theory with example in literature and history. His references to Austen and Balzac make his ideas less abstract and make them richer. Fortunately, he does this often. 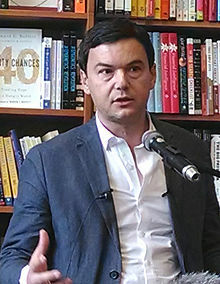 Some American critics would have you believe that Piketty is anti-capitalist / pro-socialist. I didn’t see that. I’d say Piketty is for open markets, strong on education, and democratic. From an American point of view, he may seem left wing, but to most of the developed world I would place him closer to the center, slightly left. One thing Piketty’s analysis can’t or doesn’t take into account is the exponential change in everything starting at the end of the 19th century. He touches on it a bit (pop growth rates on page 80), but this is factor. I believe that there is a correlation between growth rates and birth rates, with growth rates lagging birth rates. But this is a belief I have: I don’t have the ability to show this. I was surprised by how limited economic growth is. (Chart on page 94). As Piketty mentions, people think it should be in the 3-4% range, but is much more likely to hover around the 1% range. Yet even such growth rates have a huge impact over decades and centuries. Indirectly, Piketty makes the case for Naomi Klein’s thesis on disaster capitalism. The biggest opportunities for growth in the 20th century occur as a result of the World Wars. Take a look at the charts on page 97 to see what I mean. Wars are terrible for people and cities but good for economic growth. Another thing he doesn’t touch on is the destructive nature of IT on capital. Being an IT professional, I was wondering if he would examine capital in the 21st century from that perspective, since IT is having a greater and greater effect on our economies, and as more things become digital, the depreciation of capital related to those things accelerates. If you’d like to read more on that topic, you won’t find it here. It is interesting to note the stability of capitalism in the 19th century, at least in Europe. It was a conservative time politically, with limited warfare. Currency and other things economic were also stable then. No point here, just something that struck me as interesting. I believe that an accumulation of capital leads to anti-democratic measures by capitalists that result in revolutions or wars, which lead to the destruction of private capital. Piketty doesn’t go into this, but it would be interesting to read an analysis that shows a relationship between the accumulation of capital and the advent of wars and revolutions. I found this fact fascinating: after the Napoleonic wars and World War 2, Britain’s public debt was 200% of the GDP. 200%! I found this fascinating, first because there is a lot of worry now about the wealthiest nations having their public debt going over 100% of their GDP. Yet Britain’s was much much higher in those two cases. How did they reduced that debt and bring the percentage down from 200% to a much smaller number (as seen in the book)? Inflation. It was done over a very long period of time, but it is proof that high debt can be brought down and that it isn’t irreversible. Reading the section on slaves and capital made me think many things, including the idea that capital based on anti-democratic or inhumane means is precarious — think of capital that pollutes or depends on the deprivation of otherwise rights….it is unstable capital — and that capitalists and not just socialists should argue for an economic society based on democracy and human rights. One thing Piketty does well is whenever possible he links data from the US and Sweden because they are both relative outliers to the UK, France and Germany. It also highlighted to me how much the US lags (or leads, depending on your viewpoint) much of the developed world. Piketty is big on education. If anything, I think he gives it too much weight. People from better schools stay wealthy not just because of what they learn but who they connect with in such schools. (Maybe it is different in France, but I doubt it.) Establishment schools are smart enough to let new blood in but they are far from meritocracies. To me, Piketty seems to have a blind spot when it comes to academia that he doesn’t show elsewhere when talking about inheritance or super-managers. Piketty makes the case that taxes are better than debt. I made this note: “The concern for progressives is that capitalists will drive down both taxes and debt by abusing social programs.” But I don’t know why! 🙂 Ah well…it was likely a good thought at the time of reading it. Piketty talks at the end about the contradiction of capitalism is r > g. My belief is that this formula should be more complicated and that when you add a time factor in there and some other dependencies, you see have a better model and formula (or formulae) on how capitalism corrects itself, either through war, or revolution, or other drastic social change. But this is just another belief I have. As you are reading it, you will likely have your own notes and marginalia. Let me know what you think. This entry was posted in ideas and tagged Books, capital, capitalism, economics, ideas, money, Piketty. Bookmark the permalink.